What is the clinical term that describes people who keep on making the same mistakes and expecting different results? Yeah, it is called “crazy.” Well its easy to see that the economics of Hollywood are just completely crazy. I read recently that Cass Warner, the great granddaughter of Harry Warner wanted to remake “Casablanca” which is in the history of crazy ideas, a crazy idea. If you don’t believe that there are bad films being made in Hollywood, then I have just 3 words for you: “The Lone Ranger.” They spent $225 million to make it and it was a flop at the Box Office. The website Rotten Tomatoes gave it a 25% which isn’t that great either. I read one of the reviewers who mentioned that this is the very essence of soulless corporate excess and celebrity self-regard. 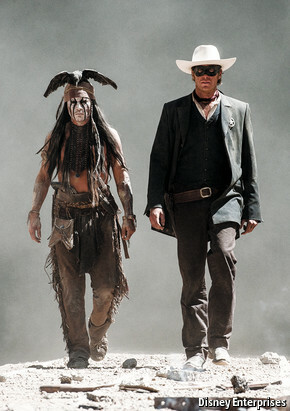 And I haven’t seen The Lone Ranger yet but I have seen Divergence (another Depp vehicle) and it wasn’t great either. The lack of any original thought or trying to do something different is what I think is the problem because Hollywood has no idea what its doing. Companies like Disney should stick to Comic Book movies and doing Pirates of the Caribbean Part 32. Trying to revive an old story and make it into another franchise like Pirates was a serious blunder by Disney and Jerry Bruckheimer. So maybe that’s a “bad” example. Okay, let’s try “John Carter” instead. Same premise, let’s revive a sandals and sword genre that tried to be Avatar meets Star Wars. Not exactly a stellar performance at the Box Office and I’m pretty sure that the audience was left wanting. Come on, let’s not kid ourselves. There’s been *some* great movies but the fact remains that there’s bad ones out there. And if things continue the way they are, which is more than likely, then we’ll continue to see films that don’t have much of storyline, rely on VFX to wow the crowds and look to the bottom line to be the sign of a success. Tragic, boring and unimaginative are words that come to my mind when I think of this. Is that a turkey on your head? IN 1983, when William Goldman, a star screenwriter, revealed the inner workings of the film-making business in “Adventures in the Screen Trade”, Hollywood was in turmoil. The studios were still reeling from a string of flops, most notably “Heaven’s Gate”, a Western released in 1980 that had cost $44m (a huge sum in those days), ruining United Artists, the studio that made it. Mr Goldman’s book is best remembered for coining the rule that in his industry, “nobody knows anything”: it is anyone’s guess whether a film will be a hit or a miss. Three decades on, following such big-budget turkeys as “The Lone Ranger” the situation in Hollywood is much the same. Only more so. These days the studios assume that to get people into the cinemas, films must be splashier, so production budgets can run in excess of $300m and cost an additional $100m-150m to market. When Disney’s “John Carter”, an adventure flick, bombed last year, the entertainment giant suffered a $160m write-off. Its studio boss, Rich Ross, was told: so long, and let’s do lunch some time. Mr Goldman described how, by 1983, the studios had all but given up developing their own ideas. Instead freelance writers, producers and other outsiders toured Hollywood touting ready-cooked packages, often with the stars already signed on and the script written. Now the studios, having cut their remaining development spending to boost their marketing budgets, are even more reliant on outsiders to design their product; imagine if Apple or Toyota did this. The studios are also looking outside for the money to finance films. A new species of intermediaries, such as Village Roadshow Entertainment Group and Skydance, have sprung up to bankroll projects. As Mr Goldman described it, studio executives were like baseball managers: “They wake up every morning…with the knowledge that sooner or later they’re going to get fired.” Again, this is now truer than ever. As films’ budgets have expanded, so too has the risk that a flop will end an executive’s career. The past 18 months have seen more executive turnover than usual: four out of the six main studios have seen change at the top. In 1983 studio executives were often failed agents. Now they seem to be businesspeople. For example, Jeff Shell, who took over Comcast’s Universal Pictures in September, is a television boss with no background in film. Since everybody still knows that nobody knows, studios continue to show early cuts of films to focus groups, to determine how to tweak and market them. But even after a film’s release it remains unclear why it boomed or bombed. Why was “Gravity”, starring George Clooney and Sandra Bullock in a tale about stranded astronauts, one of this year’s hits despite the misgivings of its studio, Warner Bros, whereas “The Lone Ranger” was such a flop, despite Disney’s high hopes for a film starring Johnny Depp? “Hollywood is always in crisis,” jokes an unusually publicity-shy talent agent. Indeed, his office is in Century City, a district full of high-rises in Los Angeles that was once the backlot of 20th Century-Fox until it had to sell up because of the crippling cost of its 1963 epic, “Cleopatra”. Faced with bankruptcy 50 years ago, Fox might have been better off keeping the property and junking the film-making. The industry’s return on capital has been chronically anaemic. The media conglomerates that own the major studios grouse about the lousy economics of the business, particularly since DVD sales peaked in 2004 and then waned, with consumers shifting to lower-cost rentals and subscription services like Netflix. Technology should have helped Hollywood, by lowering the cost of distributing films, but it has also cost the industry dearly, as film-makers doll up their movies with expensive special effects, and negative social-media buzz kills films before they even open. How will it play in China? Thirty years ago Hollywood tried to make films that appealed to “popcorn buyers”: 16- to 24-year-olds who used to go to cinemas in droves before they became so preoccupied by their smartphones. Then they focused on films that would sell well on DVDs for home viewing. At the peak in 2004 the sale of physical media accounted for 48% of the big studios’ revenues in America, according to IHS, a research firm. Since then, the value of their sales has dropped by almost half. Today Hollywood tries to tailor its products to the tastes of film buffs in big emerging economies, especially China, which is now the world’s second-largest movie market (see article). The farther a film can travel, the better, which means the studios are exporting films with fewer American elements. “Big Hollywood films have no national ideology attached to them today,” says Michael Lynton, the boss of Sony Pictures. Consider Fox’s four “Ice Age” cartoons, which together grossed around $800m. They are set in no identifiable time or place, and the characters can easily be dubbed into local languages. Hollywood has always been a “caste-system town”, in Mr Goldman’s words. That remains true, but the tiers are shifting. Working in television used to be considered less desirable than unemployment; today it is where most of the money is, so writers, producers and the studios themselves are focusing more on television. As for Mr Goldman, who is 82, he has moved to New York, and is writing a musical. As luck would have it, the big film studios are putting money into Broadway musicals. But as “Springtime for Hitler” showed (Mel Brooks’s musical designed to flop that becomes a smash hit), even here nobody really knows anything. Corrections: An earlier version of this article mistakenly titled Disney’s flop movie as “Johnny Carter” and gave the wrong release date for “Heaven’s Gate”. It’s always something of a journey when one sets out to make a film so it’s an understatement to say that this has been a great adventure. And here we are, after 3 months of pre-production with another month of production and it’s “In the Can” as they say. There’s these moments in life where you wonder how it all began and why it went the way that it did. In retrospect, I don’t know how or why but I do know this: we wouldn’t be here if it weren’t important. From the beginning, I have believed that there was a reason that 4 guys from different parts of San Diego somehow came together and formed an association that made a 20 minute Action/Suspense Film that took just 6 months to be completed. For much of the past 10 days, I’ve been in my Editing Studio non-stop as I took off the Thanksgiving holiday week to work on editing. I’m happy to report that I have over 13 minutes of editing completed. Currently, I’m working on getting Picture Lock and if all goes as planned I should have that in the next few weeks. Mostly I’m just doing the edits with syncing the video and audio together on the timeline. If I had another week off from my day job then I could say that this would be done and we’d have Picture Lock in another week so I’ll speculate that it’s going to be a couple of weeks till then. Keep in mind, we’re going to need Color Correction (which I have a lead on for doing this, courtesy of Sue Vicory. Thanks Sue!) and we will probably have an Audio Specialist work on the Sound (not the Music or the Sound Effects, just the Sound in general.) And last but not least is the Special VFX which I’ve been looking at. So far, I’ve got a couple of great shots to put in the Muzzle Flashes. The action came out very well and I’ve done a bit of manipulation with the video so it’s coming along nicely at this point. Late last night, I put aside my mouse, put my feet up, turned off the light and watched the first 13 minutes. The opening sequences are really beautiful to watch as the weather was so nice, the locations were very pristine, quiet and framed well. So it’s truly an amazing thing to watch. The major sequence is The Garage Fight (scenes 12 & 13). I anticipate this taking the largest amount of time to edit as that’s where the majority of the action took place. I can’t really say what to expect as I’ve not looked at much of it yet as I’ve been trying to focus on getting the storyline editing done which is my priority. So I’m heading into there this week and I’m optimistic on how things evolve. After that, we have the scenes of the Governor’s office and the ending as well as doing the Voice Overs. That will go quickly as I don’t anticipate it giving me much of a challenge. After what I’ve done so far, the ending parts will be a Vacation. Overall, I can’t tell you how great this looks. From the way it was lit and the sound (thanks Don & Marci!) to Terry’s expert handling of the camera to give me a lot to work with (thanks Terry!) to all the actors giving it their all. This is something special. I’ve worked on other Shoots before and there were technical issues or glitches or the director and the screenwriter fought like cats and dogs lol. But this one ran like a well-oiled machine. It’s hard to describe what I feel in the moments we captured because they are little bits of time encapsulated forever. I was usually so busy being the Producer with other activities On-Set that I normally didn’t have much of a chance to watch what we were doing. But now I have a front row seat and I’m really enjoying the view. I can’t wait to share it but that would be premature right now; it’s very rough and I have so much more to do. My focus remains on getting it edited so we have Picture Lock, then we can start doing the fine tuning with the Music Score, Special VFX, etc. Will keep you apprised of my progress. If something bad is chasing you, bear in mind that when you try to start your car, no matter how reliable the vehicle is normally, you'll have to crank the engine over many times before it will fire up. If you have defeated the monster, pay close attention to the camera, if it pans away for no apparent reason at all, get the hell out of there.